It is that time of the year, dear readers when you will find yourself faced with a good deal of football news. To ease you into this, our first "football" post will actually be a fashion post as we have a very early bye week this Saturday. 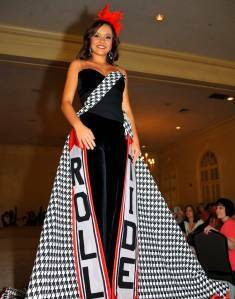 Billy Reid recently conveyed the startling fact that Alabama has the third most members of the Council for Fashion Designers of America after New York and Los Angele. Who knew. Not to mention we have a slew of pageants. The big one being Miss Alabama. Champion is headed to the Miss America Pageant where there will be an event called "Show Us Your Shoes." This is kind of a throwback to the old days where each contestant wore a dress representing their state so you had corn stalk dresses and Mount Rushmore hats. Clearly, the producers of Project Runway were big Miss America fans. 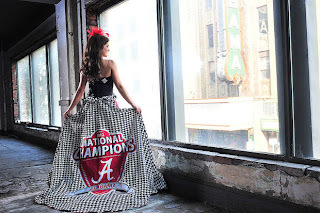 Since Champion has been at the University of Alabama during its reign as National Football Champions, it only seems right that she commemorate this feat with a big old Roll Tide dress. Designed by Ann Northington, it is a jumpsuit with a fitted bodice and pants. 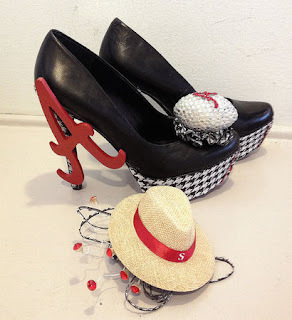 There is a full houndstooth oversized float with the Alabama Football National Championship emblem in the center. The float is designed to "hang from the back of the car in the parade." The front panels of the float feature the ever present, "Roll Tide." As for the shoes in the Show Us Your Shoes event. You didn't really think they would be simple, black ballet slippers. Great use of that Belk's accessory wall. The tiny hat pin, brooch is a homage to coach Nick Saban's favorite hat. There is not really a good place on the jumpsuit to pin it, so she is taking it for good luck, I guess. I am thinking this dress just might start a trend toward houndstooth as the new favorite prom dress material. And what girl hasn't dreamt of wearing a dress that would hang from the back of the car.